Everyone in the professional world wants to be highly successful, they want to be a part of a great team where they can work and grow as an individual. They are always looking for a good boss who can guide them and listen to them. Getting a good boss is highly essential for success and growth, because they are the ones who can truly bring success to an individual. While on the other hand, if a person gets stuck with a bad boss then things might be unpleasant to work. A bad boss never allows anyone to grow or encourages anyone. They do not believe that their team deserves happiness and success. If an employee is stuck with a bad boss then working condition for the person might become very difficult to face because with time they might lose interest in the job and work. 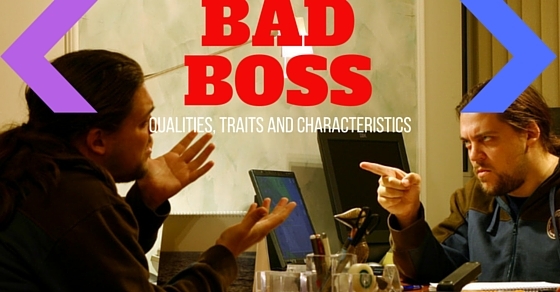 Here we have discussed few qualities and traits of a bad boss. A major quality of a bad boss is that they never allow the members of the team to express their views or ideas. They always think that they are right and prefer controlling each and every decision made within the team. They hire the candidate and decides how the job has to be done or the goals to be achieved. They lack consideration about the individual thinking of problem-solving. A team always looks up to their boss for guidance and direction to achieve the goal. But a bad boss lacks the capability to direct to guide anyone, they never share the guidelines of the work or provide any information regarding the project. A true boss is someone who understands the team and provides the right path to the team which a bad boss is never doing. They do not understand the importance of encouraging the team and guiding them to the best of it. A bad boss can never appreciate a good thing done by an employee and even on the smallest of the mistake the boss keeps on bullying everyone in the team. They can carry on with these grudges for a very long time. They sometimes highlight the mistakes in front of everyone. Even on the slightest of the error, they keep on telling about the consequences of losing the job and instill fear within the team. They create the culture of fear within the team, hence, the team lacks the unity and strength. They never appreciate or encourage anyone when a certain goal or target is achieved. To progress in a company there is a certain amount of team effort involved, they never appreciate this team effort. A bad boss never pays attention to their team or the efforts they put in for the work. But they are ready to criticize the slightest of the error. They never thank anyone for the work or effort they put in but always expects full dedication from the team. A bad boss never encourages the positivity within the team, the culture of trust and unity is always lacking in the team. They ensure that the team members never trust each other, they play these dirty politics to always learn about what is going on within the team. This happens due to the fact that they lack trust in the team. They might even call employees separately and might tell different stories behind the back. Even if something goes wrong they try to bring down a certain member of their team and never take full responsibility for the errors. They never believe in sharing the credit for the good job done with their team. On every success they think that is has happened because of them and do not look towards all the good things done by their team. The hours of hard work spent and intense contribution made by the team is never recognized to the higher level. A good boss is always proud of the success of their team and ensures to be proud of the accomplishment of their team members. The following mentioned are few bad manager traits and qualities of a bad manager. A bad boss always avoids or tries to get out from the art of communication from the team. Instead of listening and talking to their team members to understand the challenges and problems they might be facing, a bad boss never spent the time to know of it about their team. They always are busy with something or the another and they do not know their own team properly. While a good boss understands the importance of communication and is always ready to talk to their team about an idea or a problem and is always ready to sort out any issue within the team they might be facing. One of the major traits of a good boss is that they are a patient listener, they see to it that everyone share their ideas and work together in the team or any problem is discussed with them in private. While a bad boss is never interested in listening or knowing any of it, they do not give time to their team to know them or learn what they might have to say regarding the project. They always think that they are right and do not value others opinion. For the team to be happy it is important to them to be encouraged by their leader from time to time because a leader is someone they always look up to. A bad boss believes in creating the fear within the time by telling the employee about all the bad consequences or the person might be losing the job on the slightest mistake. For them, team strength or team encouragement does not matter as long as the job is done for them. Their mantra for the team is that everyone should listen to them and believe that they are right. A good boss knows where they want their team to lead or always create a visionary plan for their team to reach the best heights. They know what they want and what they are doing and how it will be achieved. On the other hand, a bad boss is so self-centered, that they do not have any vision for their team or how they can succeed. They themselves don’t have enough knowledge or desire to understand as to what they want their team to do or where they want to lead the team. For a bad boss, others opinion or knowledge never matters. They always think that their ideas are always right or what they do is great. They do not look into the consequences of their doings good or bad. They make mistakes and blame others for them, so you need to know how to protect yourself. They always tend to find the scapegoat to blame for something or the other. They never acknowledge their mistakes They never use the words I am sorry because they think that might make them look bad. A good boss has always a strong will power to do something, they are always up and ready for challenges and take their team along with them to the best of results. While contrary to this a bad boss has no right knowledge as to what lies in future or what is that which can make a team successful. They lack will power and during the time of crisis they are the first one to panic. They themselves have no knowledge as to what they are doing and why they are doing. The following mentioned are few top characteristics of bad managers. A good boss is never scared of any challenges that lie ahead of, if something goes wrong they take the responsibility and the consequences happily. While a bad boss is always scared as to what might happen if something goes wrong. They don’t lie being questioned even if a question is valid and relevant to the topic. They try to control everything around them due to a certain amount of fear they live with. The fear in their heart is so strong that they think their own team member can harm them or turn against them, hence, they never encourage a healthy team scenario. A bad boss is never fun, they do not encourage time offs, or vacations which can be fun. Because they think them to be a waste of time and of highly unproductive in nature. They always push the employees to do the extra work, be in office even after office hours and work. They always emphasize the work as the only important thing in life. They are not really bothered about family or health of the employee. They do not appreciate anyone in the team who takes off even if it is due to genuine reasons like health. A good boss generally knows during the crisis what is the best decision to make. They are always decision ready and do not take too much time on deciding things. While a bad boss is unsure about everything, because they are not interested in knowing their team or consider their opinions, hence, during the crisis situation they keep on dwindling around the decisions, they don’t know what is good for the team or what is the best possible decision to be made. A bad boss never pays attention to the members of their team, they are not aware of the strength or weaknesses of their teams. Hence, when a work is to be delegated to be done efficiently, they have no knowledge as to what should be done right to get the job done on time. They lack the skill to manage the disputes that arise within the team. Their skills of delegating the work is weak, they lack the true skill of using the people’s talents for the best of the company or provide enough challenges for the individual in a team to grow. For a good boss things always revolve around a team, even if it is their idea that has been incorporated they always share the success with the team. They are always on the edge and provides other employees to shine for the success, they provide the right credit to the team member for the success and results. While contrary to this, a bad boss does not believe in sharing the success with the team. Everything that happens within the team or any success a bad boss always thinks that it had happened because of him. They are highly self-centered and think that the world revolves around them, without them nothing good can happen. A good boss gives freedom to their team to decide as to what and how they plan to achieve the goal and the target. They provide full freedom for the employee to grow and hone their own personal style. While a bad manager is always there peeping over the shoulder and keeps on pointing out the tiniest of the mistakes without knowing the complete information. As they lack trust and faith in their team, they are the ones who tell their teams a certain way to do a work and do not allow freedom to decide or think about the work they do. This is one of the traits of a bad manager. Before getting into a job it is very difficult to know if the boss you are getting is the good boss or the one that everyone dreads about. It is difficult to be under a leadership which does not provide effective motivation and encouragement to succeed. But on the other hand, a smart employee will always know how to handle such a boss without any hassles. With time one can learn the art of handling a bad boss, and can purely focus on their goals and achievements for their own personal growth. If things are very difficult to survive then it is best to look out for the other opportunities ahead.